Whales should look over their shoulders not only for fast-moving ships but also for politicians. Those buoys were part of several efforts to slow ships in the whales&apos; playground. 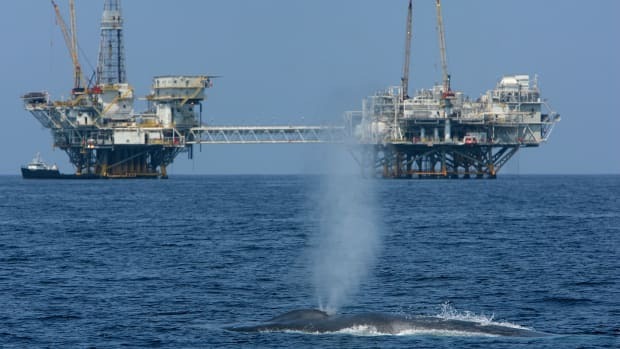 In addition, the National Oceanic and Atmospheric Administration has for several years been working on its own fairly extensive "ship strike reduction strategy," including slowing ships to 10 knots or less in some whale-rich areas of the East Coast. "Our scientific analysis shows that a 10-knot speed limit in critical areas will significantly reduce the threat to these endangered marine mammals," NOAA administrator Conrad C. Lautenbacher Jr. was quoted in a release sent out Monday as part of the agency&apos;s final environmental impact statement on the measures. And as the the National Marine Fisheries Service says, "no mortality or serious injury for this [whale] can be considered insignificant." Two years ago, however, when NOAA first proposed the rules, the "critical areas" off East Coast ports were 30 nautical miles wide. Monday, the zones had shrunk to 20 miles. While fans of the whales are happy with any go-slow zones where none presently exist, what happened to the extra buffer? "Internal Administration documents received by the Committee indicate that the delay in protecting the right whale appears to be due to objections raised by White House officials, including officials in the Office of the Vice President," wrote Henry Waxman, head of the House Committee on Oversight and Government Reform, in April. "The documents show that White House officials have repeatedly required NMFS and its parent agency, the National Oceanic and Atmospheric Administration (NOAA), to respond to objections to the scientific justification for the right whale rule. In some cases, White House officials have apparently conducted their own analyses using questionable assumptions to delay the final rule." Those analyses happen to coincide with studies commissioned by shipping interests that opposed the breadth of the whale protection measures. "We continue to see no scientific or statistical support on the record of the rulemaking to show that a 10-knot speed limit for large ships around East Coast ports will help protect right whales," the World Shipping Council said in its own release. The tenor of Waxman&apos;s letter suggests he was not pleased with interference in scientific overwriting conducted by the White House, a matter that our Joan Melcher has shown as common in the current administration. "While I appreciate the value of vigorous scientific debate, I question why White House economic advisors are apparently conducting their own research on right whales and why the Vice President&apos;s staff is challenging the conclusions of the government&apos;s scientific experts. The appearance is that the White House rejects the conclusions of its own scientists and peer reviewed scientific studies because it does not like the policy implications of the data. This is not how the review process is supposed to work." Independent of the politics, how important are the proposed rules? NOAA reports 83 percent of right whale sightings in the Mid-Atlantic. At 30 nautical miles the figure rises to 90 percent, according to an NOAA spokesman quoted by TheWashington Post. Meanwhile, NOAA says "existing protective actions, such as aircraft surveys and mandatory ship reporting systems that provide advisories and information on right whale locations to mariners, will continue. Additional steps include voluntary routing measures, consulting under the Endangered Species Act with federal agencies on operations of their ships and an extensive mariner outreach and education program." Oh, and Waxman also excoriated the feds for their go-slow effort in getting new whale-safety measures passed. Since the rules were intitally proposed and his April letter, seven right whales were known to have perished from ship strikes, one may have died and seven were injured. The good news is that endangered whales can be found where they were thought extinct. The bad news is that a sea-going superhighway may soon overtake their unknown refuge. A cry of 'game over' has been issued over recreational tanning.